Discussion in 'General Discussion' started by bgillisp, Oct 27, 2018. Just a quick update before I leap into bed! It's so late over here! Took me all day, (between breaks and kids and errands of course) but I got my large bridge fully evented! So yay! Still need to add water effects to it but I'm going to save that for later on. That bridge has taken up too much of my time already. Moved on to create gathering nodes and working on eventing dynamic trees that turn transparent as you walk behind them. All in all, my large cave is coming together wonderfully! Also, knocked out another character bust. Decided to ditch the original cast for new ones in my art style. Ignore the big guys and the lady, they are just stand in for right now. @Paladin-Cleric of Awesome, I am loving the jungle map. And I have a question, where in the world does everyone keep getting those beautiful sunbeams from? Are they custom made or is there a free resource somewhere I've been missing? 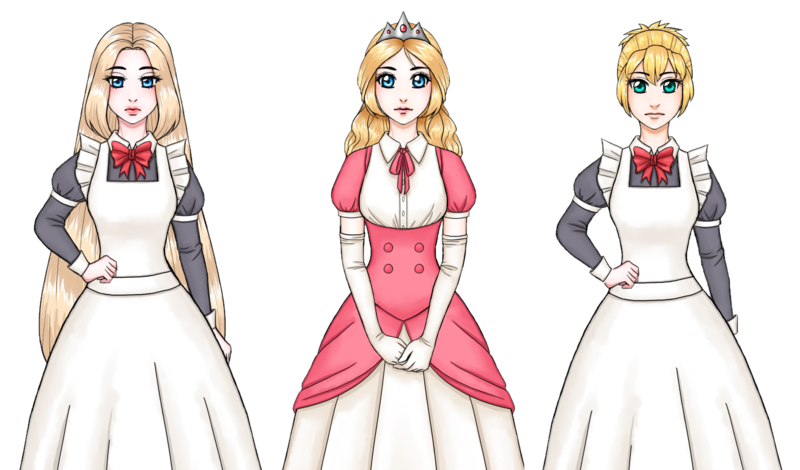 @Plueschkatze, I love the art style you have going on. I'm eager to see what the rest of the game will look like. @Dezue, funky fresh as always! Your art is always a visual treat! @Elissiaro, did you ever decide if that opening forest is going to be a sneak scene? I really hope so! Everyone's games are coming along so beautifully! Just seeing sneak peaks of everyone's games gets me excited to play them all come contest end! Keep up the great work everyone! Dezue, P_Kun and Plueschkatze like this. @Guardinthena thank you! I make the sunbeams in gimp to the sizenof the map, guasian blur it like 5 times until it looks blurry and see through and then half the opacity. @David Lister tgank you! I love mapping nature! Guardinthena and David Lister like this. @OnslaughtSupply WOW! love the atmosphere of that place, looks very different from what I'm used to see, keep up with the good work! @Plueschkatze Keep it up! I know its a harduous work to create hand-drawn maps that feel just right! Love the character, will it be animated frame by frame? 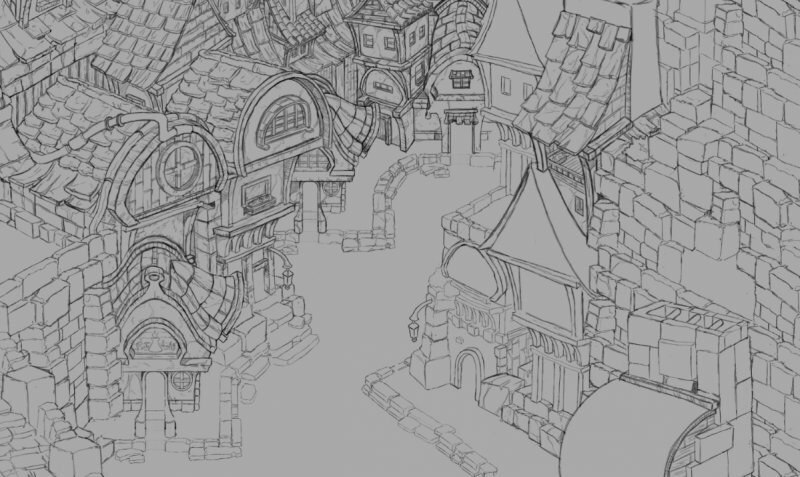 We're almost finishing the lineart of our town map, really eager to show you guys!! Dezue, Guardinthena, OnslaughtSupply and 1 other person like this. @David Lister I have others I intend to finish this weekend as the goal is to have a bust/image for everyone in the starting village. Trying to keep their looks very simple to help show off them being non-fancy villager types. @Dezue Thank you! I try to keep my starting villages looking peaceful so I'm glad it's coming through. That pumpkin looks utterly baked. @slimmmeiske2 Dang, that's quite a bit for a few days. Did you make the script yourself for shut down? @Tuomo L You're just zooming through the maps, how many do you have made so far? Not much here for the last few days. I started designing the layout for the three other "starting" maps (Cave, Deep Forest and Mountain) and setting up the beginning quests but mainly been working on some lore bits for "readables" in the game. While it won't be in the starting village, I do plan on implementing a library of sorts later for the player to reread everything they've read once before in the game. Luckily, today is the start of my long weekend so I hope to get some art and writing done. Zelgadis85, Dezue, Guardinthena and 2 others like this. 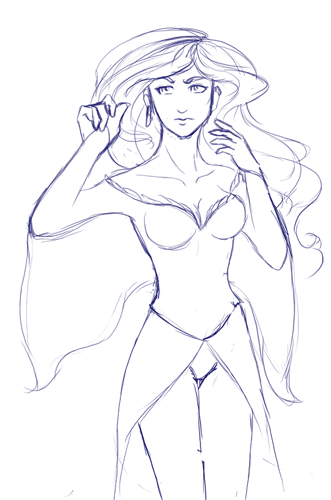 Decided to start working on the bust for my third character, and also fix character nr2. I also fixed the forest map, did some animations (in the engine) and worked a tiny bit more on events. Spoiler: All three characters so far. I put them out of order cause it looks better... So from the left, chara 2, chara 1, chara 3. 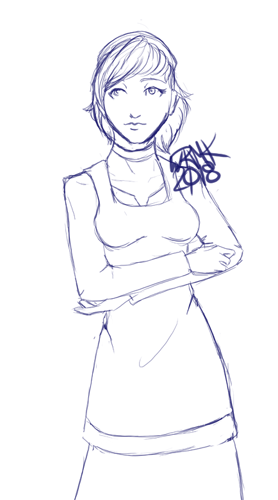 Character 3 is wearing chara 2s clothes cause I got bored/tired after finishing her head and non clothed body. But I still wanted to show off my progress. (Plus she's gonna get a maid uniform anyways). I might keep going after my break if it's not too late. Marquise*, Guardinthena, Zelgadis85 and 3 others like this. Ok, now all connecting maps are done, including a village, a plantation and the main city area of the game. This will allow more exploration for the player, and if I have time I will be adding in a few NPC’s to chat to, and maybe some quests to fulfil (obviously when I go back and fix the game up after the quests and stuff will be done before you reach the Witchfinder keep. I’m trying to think of what else I can let you know about the game, but all I’ve really been doing is mapping like crazy, I’m hoping this weekend I’ll get the Kings Castle maps started and finished and then spend next week sorting out the cut scenes and other interesting stuff for the game. Then the last week will be spent fixing everything, and adding in NPC’s and added info etc as we go. Remembering not to go overboard is the hardest part, there are so many things I can add and do and I’m sort of looking forward to after the contest (and after I finish Corruption) when I can do everything I want to do here. I still hope I win though. That would be nice. I somehow have to figure out how to get people really interested in my game enough to give me lots of positive reviews and have the judges love it for being awesome. Not making my life difficult at all am I? lol. Thothdan, Marquise*, Guardinthena and 4 others like this. @Paladin-Cleric of Awesome - Last year I kind of got that happening to me, spent too much time trying to do everything and in the end the game was barely playable, try to keep a very limited amount of content and do the best you can with it! That map is really well put together, I like it a lot, but it feels like it's missing some vegetation and perhaps some assets to fill the streets. Gabrelik, Thothdan, Marquise* and 7 others like this. @Plueschkatze Haha, I'm glad you like it, thanks! And of course I'll make sure to play your game as well! Love how your backgrounds are coming along! Your town map looks beatiful! (You're with @Creative Ed , right?) Awesome stuff! Here's my progress for today, the bottom half of the Healthy Onsen! Don't forget to eat healthy, everybody! Keep up the great work! Thothdan, Marquise*, P_Kun and 6 others like this. Ended up cranking out a few sketches today. 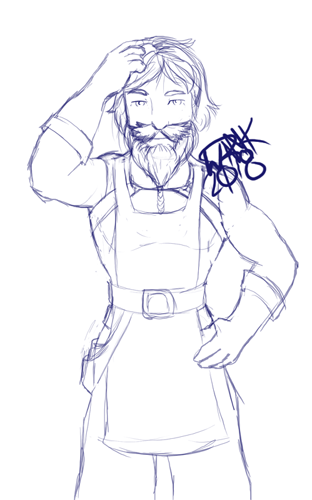 Originally started as just warm up stuff but ended up bleeding into "Let's make this the Blacksmith" and continued on. 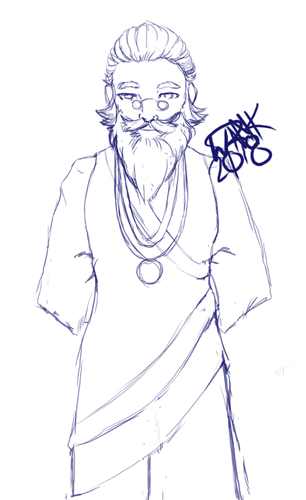 Does mean I have at least half of the adult villagers sketched out for River Lord. Still not on track for where I wanted to be on this week but getting there. Jesse - PVGames, Thothdan, Marquise* and 8 others like this. Thothdan, Marquise*, Guardinthena and 1 other person like this. Even though I'm not participating in IGMC, I was going to work on a new game idea. However all I have done since the start is part of the menu UI and mess with plugins trying to get an ABS system to work. Thinking I might have to exclude combat all-together or change out for turn based but it seems to be outdated either way. 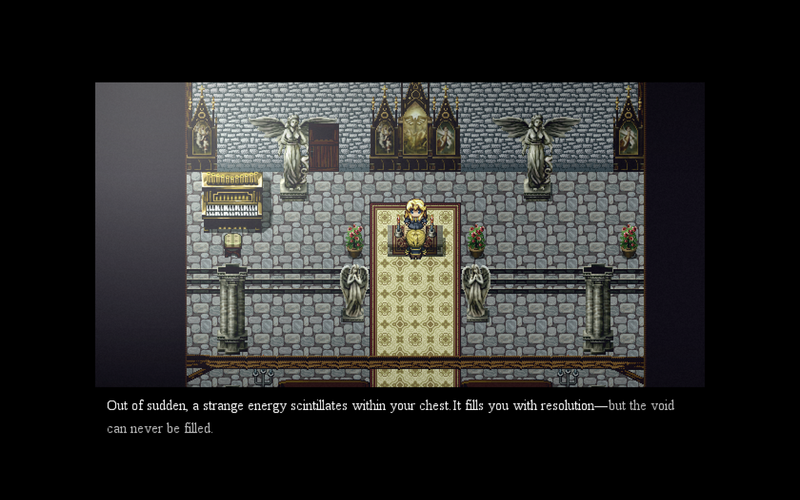 Fortunately most of these features will not be needed in the demo, so I decided to get back to the story and cutscenes. 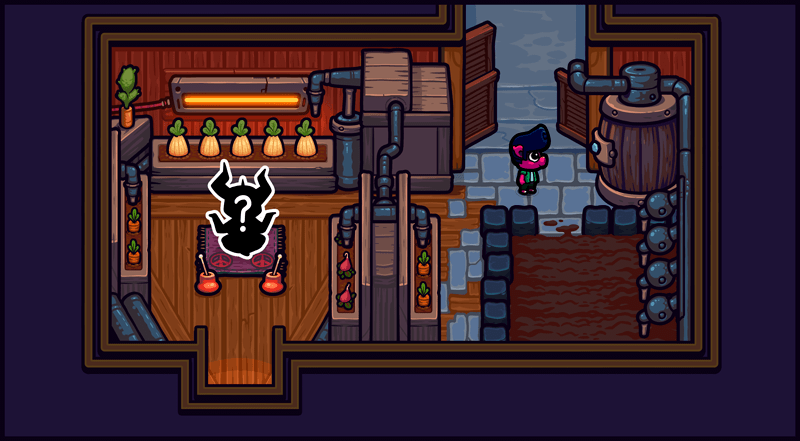 I then realized I still have a whole bunch of tiles, character designs, walk sprites and busts to work on. Looks as though I may not reach the deadline with a complete demo at this pace. I'm gonna need to speed through making the script if I wanna get to the finish line! So no bullets on what I've done today as it doesn't necessarily go towards the demo. Will be focusing on story tomorrow, wish me luck! David Lister, Dezue and Zelgadis85 like this. I hope I can have fluid 3D movement by the end of the contest, but for now I'll just use pre-rendered screens for the map. I really need to start writing out the events and story (I still only have a rough outline). I hope I don't have to cut content, I'm afraid I wouldn't be proud of my project then. I'll be visiting a friend for his birthday tomorrow, so I guess my development time this weekend is rather limited. I hope I can get out a complete working UI and the first dungeon by next week, but we'll see. Oh, and I really like everyone's progress. Just too long a list to comment on everything, so... Keep it up and stay healthy! P_Kun, Punamaagi and Dezue like this. @Creative Ed Man I wish I was good at art, because your map looks beautiful! There's only so much someone can do using mapping assets, being able to draw maps like that is amazing! Also, thanks, I totally forgot that There was supposed to be the odd items in the streets etc, so I'll get on that. lol. Guardinthena, Creative Ed and P_Kun like this. @Dezue Thanks man! Yes, Me and @Creative Ed are working together! @Paladin-Cleric of Awesome Thank you so much, we're having a hard time finishing this map, but hopefully we'll finish it soon, we can't wait to show you guys! Ok, so my knee was hurting today so I took the day off work to save myself from further injury. So I took some time to finish off the City Map and start the Kings Castle. I’m really happy with what I’ve done so far today (which is good because I’m heading to my parents for a TV night!). This week has been a long one for me; trying to balance being back to work and game making and spending time with my family. Not going to lie, it was hard. But now the first week is over I think I’m getting back I the swing of things. My goals for this weekend (I may not be able to update for you all), is to finish the Kings Castle. I am also going to give some serious consideration to changing where I start the game. Although starting the game at the Witchfinders Keep throws the people playing the game into main heart of the story, I’m not sure where the game can go after that, except to the ending. But if this is to show what can be done with the game, then… I just don’t know. I’ll have to do a big think on the matter. Marquise*, Guardinthena, watermark and 2 others like this. @Creative Ed Love the look of this soooo much. Keep up the great work. sleepy_sealion Need to work harder! I think I accomplished my October goal sort of? So for November, I want to try and learn more about parallax mapping since I've been getting burnt out on auto-tiles. @Plueschkatze Thank you! We love the style you're using and the color palette looks neat! Plueschkatze and Creative Ed like this. My! I didn't know this thread existed. Seems like I'm going to be posting some of my progress here, starting from the actual date haha. But before all, I'll comment on some things posted here. You guys are real good. This IGMC will be fun. @Guardinthena: does the bridge emerges with an animation? that would be dope. Dynamic trees that turn translucent when walking behind is neat too, though can produce lag sadly, unless you're using a good antilag like Theo's. Assuming you're using Ace, of course. @Elissiaro: those gals are way cute! @Dezue: loving the art style! Peculiar character design too - that kid's hair is funny. Well, let's see now. This is from the inside of the cirice (cirice = old english for church). It'll be for my IGMC Entry - Heartland. 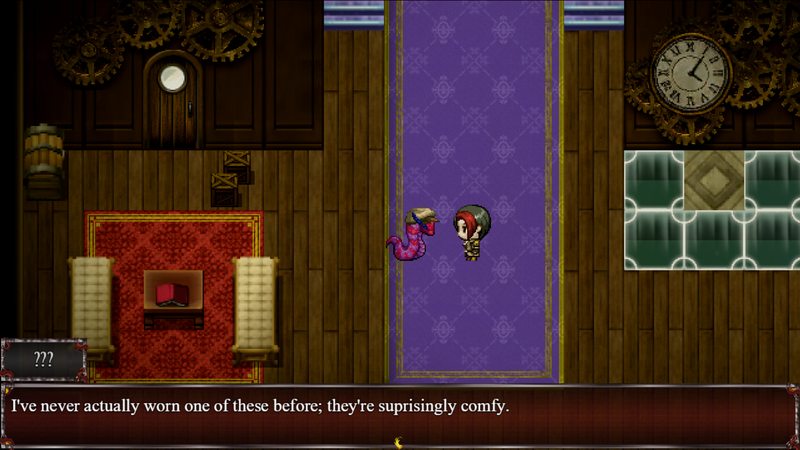 Game features no dialogues, having second person texts told by a narrator. The game is rather moody and atmospheric, focusing a lot on sounds, literature and music. When I say sounds I mean natural sounds (blowing wind, grass footsteps, rain sounds). Throughout the narrator sayings you'll see that nihilism is part of the game's mood, as well as the story itself. Ironically, the gameplay will be of a roguelike dungeon-crawler. Taken at fullscreen using Zeus Fullscreen ++ script. Various tilesets were used - Celianna's Ancient Dungeons, Sharm's Germania, and Inquisitor's XP Interior. Plueschkatze, Marquise*, David Lister and 2 others like this.